At this point in time, it’s safe to say that most copies of Windows 10 are legit, which means Microsoft has already made money off of it. Unfortunately, it looks like the company is thirsting for more, and wants to inject ads into its File Explorer tool. 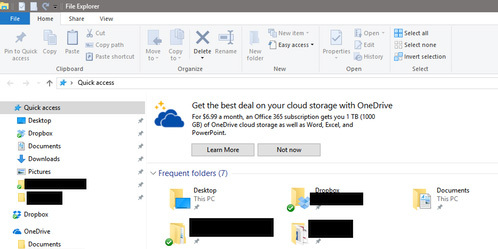 According to the folks at Thurrott, the ads (starting with promotions for Microsoft’s OneDrive cloud storage service) are easing their way into the upcoming Creators Update, which some people are currently testing in beta. There are also similar notifications in the previously released Anniversary Update. Nobody asked for this, and yet, here we are. They might just be small pop-ups, but that’s how it starts, folks. Microsoft has many other products it might want to start slinging, including Office 365 subscriptions and Skype credits – and who knows whether the company will eventually want to expand to serving up ads from other businesses? That should sort you out even if you aren’t yet seeing the ads on your copy of Windows 10. It’s likely that we haven’t yet seen the last of evils like this: Back in 2015, Microsoft began recommending apps from its Store in the Start Menu (you can turn those off too), so don’t consider yourself fully safe from promotions in your OS just yet.